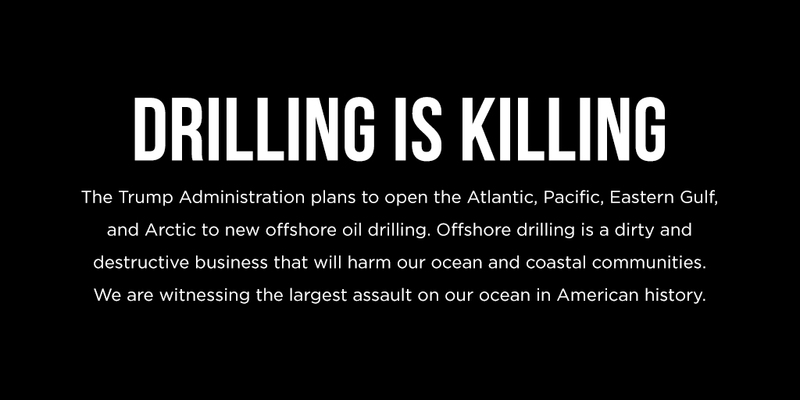 Following the theme of sacrificing the public’s favorite natural areas for the benefit of oil and gas companies, the Trump administration has just announced plans to expand offshore drilling in the Atlantic, Pacific, Gulf of Mexico, and Arctic Ocean. This drastic proposal puts our nation’s coastal communities, beaches, surf breaks, and marine ecosystems at risk of a catastrophic oil spill. Even without a massive spill, new drilling would include deafening seismic blasts during exploration, which could harm and even kill innocent marine wildlife like whales and dolphins.